Most people are divided into 2 types: those in love with fast motor yachts and those who are passionate about sails flapping in the wind. Sailing enthusiasts are keen on that feel of romance and freedom the sea and the wind give them. For them it is a journey that counts. And for motor yacht fans it is mainly the destination. They put comfort and speed high on their priority list. 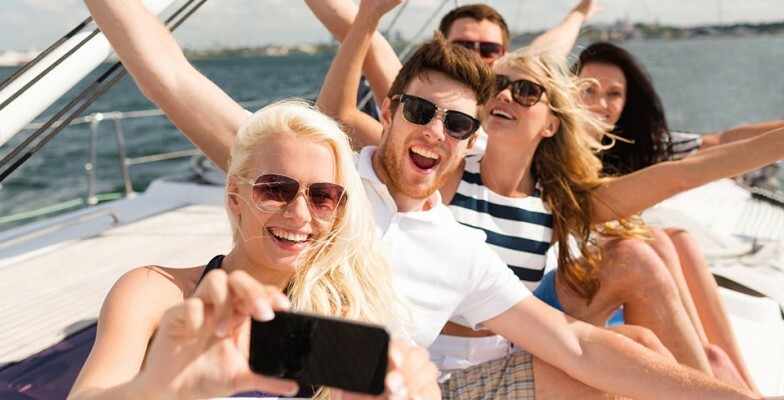 Renting a yacht you will certainly understand which type you belong to. And we are going to briefly describe you the pros and cons of the main charter vessel types. Have a read and do the right choice! Chartering a motor yacht you get an advantage of its high speed, generous indoor and outdoor space, with a disadvantage of a slightly more expensive rental price as compared to sailing yachts. The difference in price is caused by the high cost of constructing these yachts, maintaining them (especially their powerful engines), and fuel consumption. As a rule, yacht charter companies indicate a cruising speed at 10-11 knots. This is enough for a relaxing voyage with a smooth change of scenery. And for those in a hurry, the speed can be increased up to 20-25 knots, but for the extra cost. 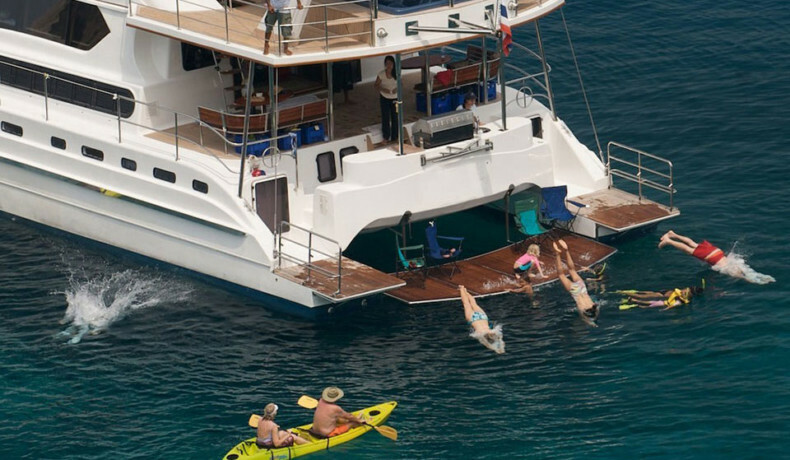 For the accommodation of guests, motor yachts have 2 or 3, and sometimes 4 or 5 decks. Cabins are usually spacious, with an expensive high-quality finish and en-suite bathrooms. 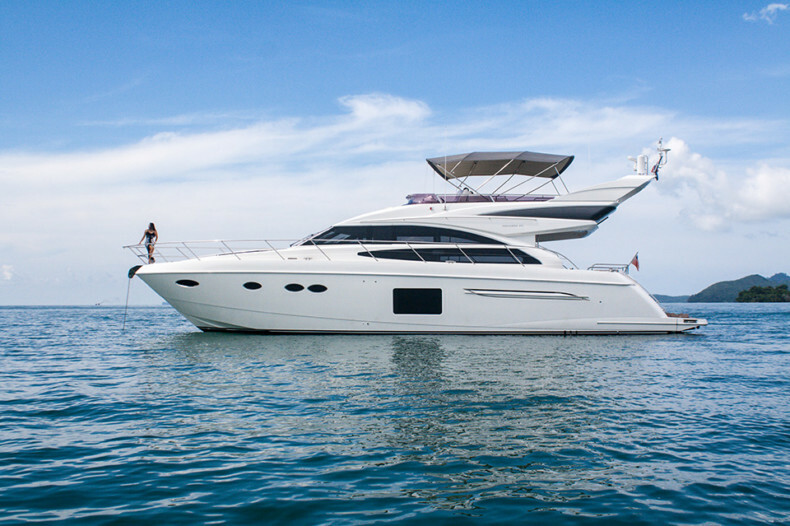 Modern motor yachts are often equipped with stabilizers to reduce the roll at anchor or when travelling in choppy seas. Even the most inexpensive yachts usually offer amenities like a fresh-water shower, tender to go ashore or to do wakeboarding, fishing rods, and snorkelling equipment. Luxury super yachts are real kingdoms of comfort. Here you are offered to relax in the pool or jacuzzi, enjoy a massage in the spa, or visit the gym. Not mentioning a whole range of water toys: kayaks, jet skis, seabobs, diving equipment, paddleboards, and much more – just ask them! Speedboats are smaller brothers of motor yachts, normally up to 10 meters. They are designed only for a day cruise to the nearby bays and islands. Although some of them offer 1 cabin for an overnight accommodation. 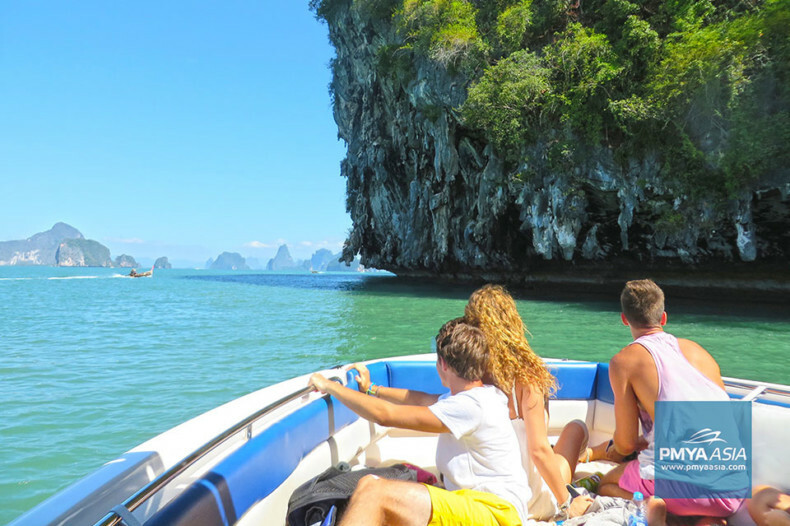 Chartering a speedboat you get a fast and comfortable trip for a very affordable price. Thanks to the shallow hull the boat can come close to the shore, and passengers can step off right on the sandy beach. 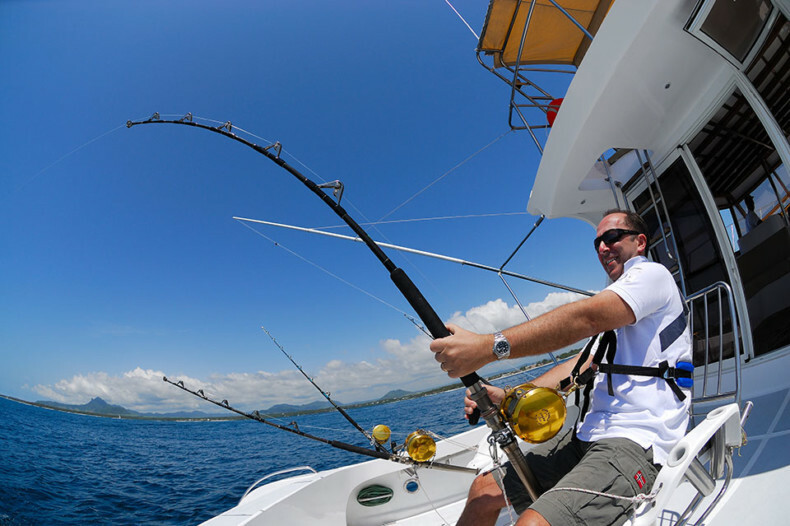 Motor yachts for big game fishing boast a large range of sizes. Many are real super yachts of 30 meters and up, with 4 decks and plush interior. However, the most popular size of fishing yachts is up to 20 meters, with rather Spartan amenities. Everything here is focused on the process! It is not about relaxing on the sunbeds or having fun on the water. It is about serious fishing at high speeds with lots of adrenaline. Fish fighting chairs for catching large fish, live bait tanks, big range of tackle and fishing rods, and sometimes even fish finding equipment – that’s what the big game fishing is about! The crew on these boats are fishing experts too. They know the process in details: how to bait right, pull, hook, and where the best fishing spots. The excitement of the fishing and the joy of a good catch are impossible to describe! Imagine yourself savouring the freshest sashimi and barbeque with a glass of wine at the cool evening breeze. Complete peace and quiet, and easy cruising under the wind-filled sail at sunset – this is perhaps what many of us have been dreaming about since childhood. 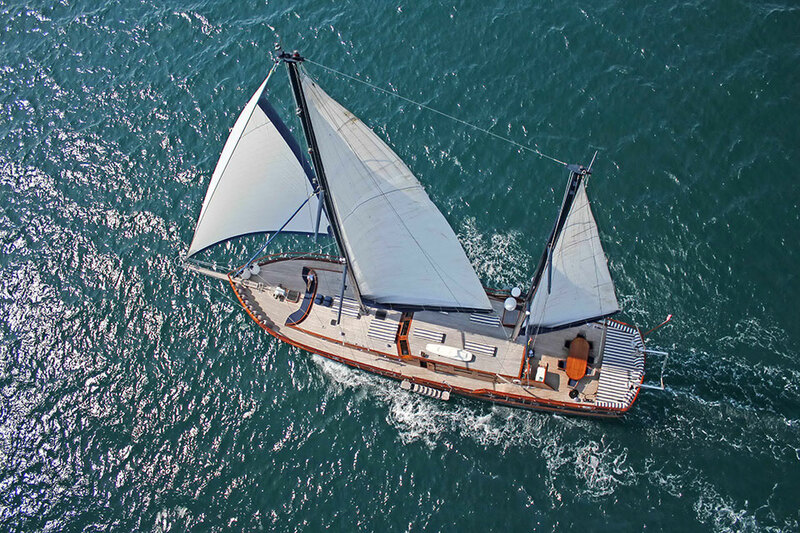 The charter price of a sailing yacht is more affordable due to low fuel consumption. The main moving power of these yachts is wind and sail. And even if the sea is too calm, there is a low-power engine to assist. The cruising speed on a sailing yacht is 5-10 knots. This category of vessels follows the special philosophy of life at sea: it is not speed that is important, but the contact with the sea, wind and nature. 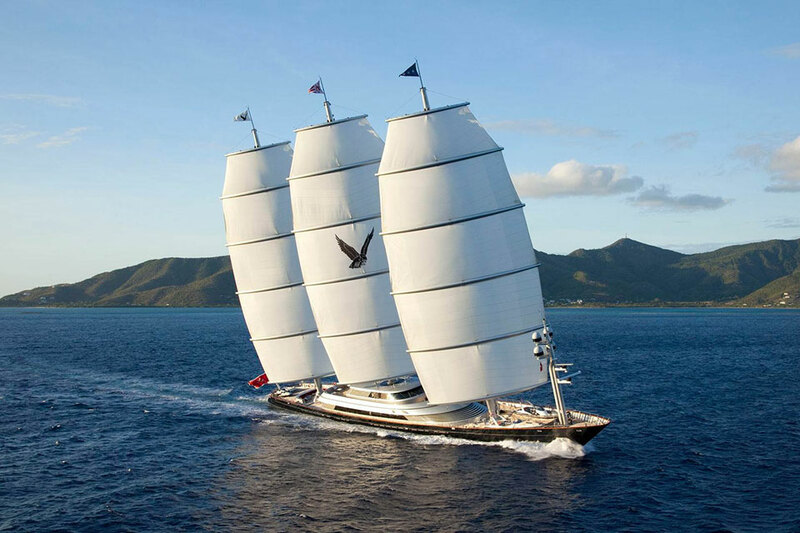 The 2nd biggest sailing yacht in the world, Maltese Falcon, has a length of 88 meters and develops a cruising speed of 16 knots. Being quite an exception for sailing yachts this performance is to be envied by some motor yachts. Today, the interior of the guest cabins and the choice of on-water entertainment of the sailing yachts are getting to match the motor ones. Although their comfort is mostly aimed at the purpose to sail. Gulet is ideal for those who as a child were deeply read with adventure books about pirates and sea battles. These wooden sailing ships are built in Turkey. Gulets are amazingly beautiful, eye-catching and create a sense of travelling back in time. Modern gulets combine sails (on 2 or 3 masts) and low-power engines. When sailing they are much more stable than sailing yachts. The main difference between a catamaran and a motor yacht is in the number of hulls. Catamarans have 2 of them. The hulls are spacious enough to accommodate comfortable cabins with en-suite bathrooms. The large space between the hulls serves as a saloon and a galley, and also creates a sound buffer between the cabins. Catamarans are famous for their stability – they “stand” on their hulls like on the feet. Being quite shallow they can approach very close to the shore, without fear of running aground. They are also faster than other types of yachts thanks to their lightweight construction and a pointed bottom of the hull – this reduces the water resistance. There are 2 types of catamarans: motor and sailing. The latter combine sail and low-power engines for cruising in calm waters and for manoeuvring when mooring. The rental price of each type can be compared to that of motor and sailing yachts.